The Uniscan Cadet rollator is the lightest walker of its type, weighing a mere 10lbs and is the perfect choice where space is at a premium. Manufactured in the UK. The Uniscan Cadet four wheeled walker is manufactured in the UK and is the lightest rollator of its type weighing just 10lbs (4.5kgs). 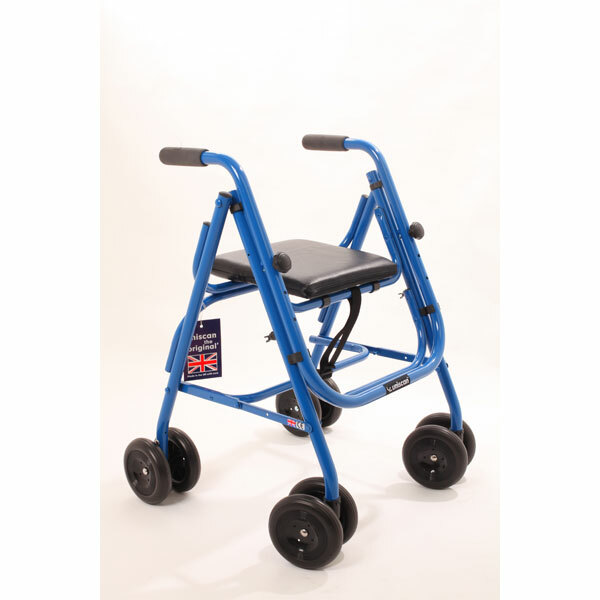 This compact, robust walker is only 23" wide making it the perfect choice where space is limited. The Cadet features a built in seat and folds flat for easy storage and transportation. There is a choice of two seat heights, 19" and 21", as well as a choice of braking mechanism - safety pressure or locking lever. Safety pressure brakes engage when you apply downward pressure on to the frame. They are ideal for those with limited hand strength. The Locking Lever brakes work similar to those on a bicycle but you can also lock into place by pushing down on the lever. A unique automatic locking mechanism locks the frame when folded and simply unlocks by lifting the pin. Handle height 29½" to 33½" or 31½" to 35½"
Choice of seat height - 19" or 21"